touches of gold paint in the crevices of the “bamboo”. We do not know if it was original or added later. The chair had no breaks, and he joints were quite stable. The finish was tired and dull. 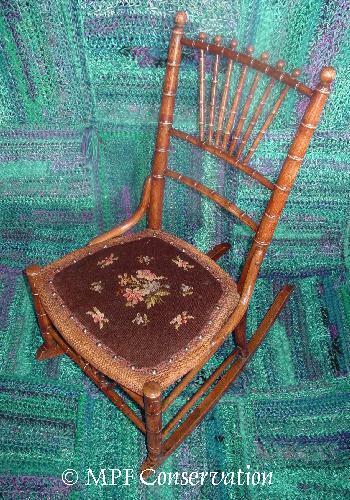 The seat collapsed and the needlepoint showcover needed cleaning and minor infill. The chair was excavated, cleaning and saving the stuffings where applicable. The finish was cleaned; we added a coating of protective traditional shellac. The needlepoint may have been added later, as the edges were nicely woven. 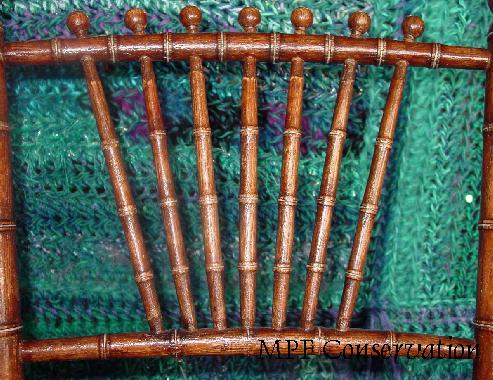 Perhaps the original seat was all woven. original size and shape. The edges were stabilized. The showcover was cleaned, and the small amount of infill necessary was performed. The Windsor Rocker just before it headed to its new home. 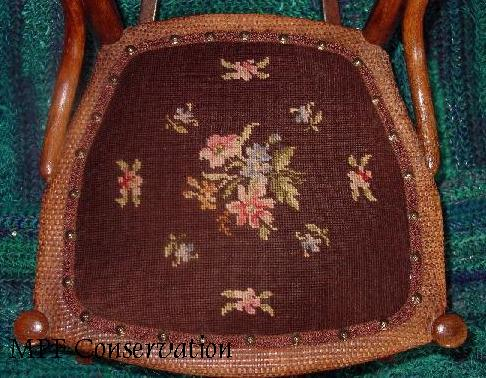 This entry was posted in antiques, chair, conservation techniques, preservation, restoration techniques, textiles, upholstery, waxes, wooden objects and tagged #cleaningtextiles, #needlepointrepair, #portlandoregon, #textileconservation, #traditionalupholstery, #upholsteryconservation, #upholsterypacificnorthwest, #UpholsteryPortlandOregon, #upholsteryrestoration, #windsorrocker, Cleaning textiles, needlepoint, traditional upholstery, upholstery conservation, windsor. Bookmark the permalink.